showing you cared enough to include it alongside your resume. Check out our best cover letter samples below to help you create your own personalized cover letter. Taking the first step toward writing a cover letter can be scary, especially if you’re unsure about what to focus on for a particular line of work. Browse our collection of industry-specific cover letter samples and learn about what to zero in on your cover letter! Climb the corporate ladder by using our collection of management cover letter templates, including letters for entry-level positions and senior executive role. From housekeeper to concierge, our hospitality cover letter templates will roll out the red carpet for endless career possibilities. You’ll breath new life into your career with our healthcare cover letter templates, which assist all professional caregivers. Make the grade by using our education cover letter templates that help teachers and administrators move to the head of the class. Your customer service acumen will be on full display when you use our customer service cover letter templates as a guide. Potential employers must know who you are and how to find you if they want to grant you a job interview. Our sample cover letters show you the best way to display your name, city, state, zip code, phone number and professional email address. There’s a right way and a wrong way to greet a potential employer. "Dear Sir" is the wrong way. Our cover letter samples show you the proper tone to use in your salutation to keep hiring managers and recruiters reading. TBreak the ice with a well-written first paragraph that includes a reference to the specific role you are seeking. This component is similar to the summary statement of your resume. Check out our cover letter samples to see how to avoid a generic introduction. TYour second paragraph and additional body paragraphs demonstrate the relevant experience and transferable skills that make you a good fit for the position. Look at our professional cover letter samples to learn the best writing techniques for this part of your cover letter. TEnd your cover letter in a way that will impress the recruiter. Our sample cover letters highlight how to conclude on a perfect note and make the higher manager look at your outstanding resume. TYour sign-off may seem like a simple part of your professional cover letter, but do not skip over this part. Our cover letter samples show the proper way to end your cover letter so you leave potential employers with the right impression. You don't need to see an advertised position to send a cover letter. If you have credible information that the position is open or will be open, you can craft a cover letter expressing interest. Your cover letter should identify your eagerness to work for the company and your qualifications for the position. Our professional cover letter builder can help you write the ideal cover letter and help get your foot in the door. 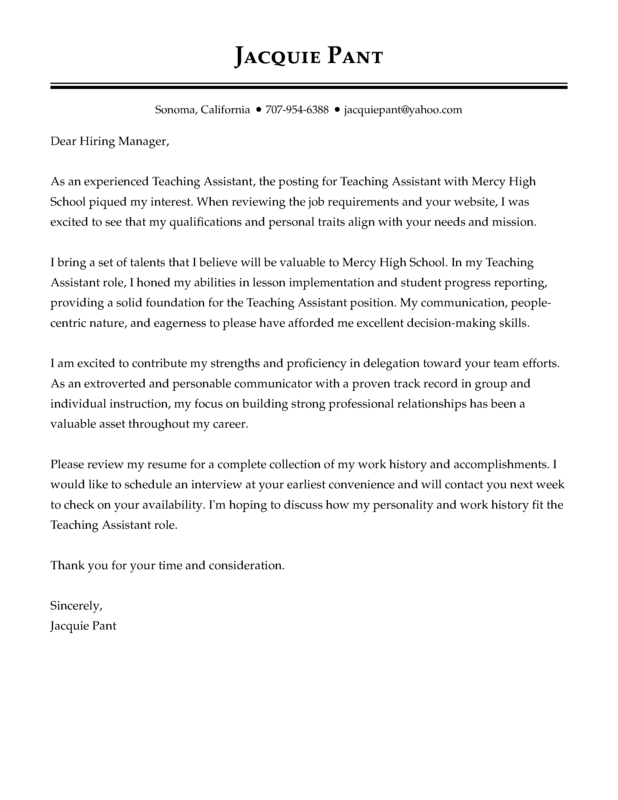 Use our cover letter samples to write a flawless letter of inquiry that will make the hiring manager look for ways to hire you. In a compelling way, express your interest in the company and show how your work experience and skills make you a must hire. Using our cover letter samples as a guide, write a cover letter that details your accomplishments in your current role with the company and previous roles. Point out that the employer already knows your work ethic and cultural fit, Use our cover letter to show your employer the perfect candidate is already working for them. Make the jump to a permanent position by using our cover letter samples to outline your achievements in your temporary role. Then explain why you would be a valuable part of the permanent team in the current or similar position. Remember, do not simply repeat the information on your resume. Use our sample cover letters to expand your professional connections and open the door to job interviews. The My Perfect Cover Letter Builder will give you step-by-step guidance on crafting cover letters your professional contacts will pass on to hiring managers. It's a benefit if you have a personal reference employed or connected to the company you want to work for. Our cover letter samples help you understand where and how to include that personal reference in your cover letter. When you decide to pursue a new career path, you need a cover letter customized to show you are up for the challenge. Our sample cover letters help you easily showcase your transferable skills and draw parallels between your past experiences and the job at hand. Doing this will demonstrate why you are the perfect person for the position. Email cover letter:Email cover letters allow hiring managers to skip the extra step of opening an attachment. Use the My Perfect Cover Letter Builder to help you select an appropriate font and cover letter format. Don’t worry about difficult downloading. We make is easy to download and preserve your formatting. Word doc:This format will pass an applicant tracking system (ATS) and is easy for employers to read. Download your letter, note that our builder preserves all formatting, and you’ll be ready to send it off. Let the My Perfect Cover Letter Builder make your cover both visually appealing and appropriate for your industry. PDF:A PDF format ensures that your letter cannot be accidentally changed or altered after you send it to potential employers. My Perfect Cover Letter samples are compatible with ATS programs. Use the My Perfect Cover Letter Builder to create a professionally formatted cover letter that can be turned into an easily downloadable, eye-catching PDF. An applicant tracking system (ATS) scans your application materials to decide if you are a strong fit for the role. To do this, the ATS looks for keywords, like the desired skills in the job ad. Our cover letter builder offers industry specific pre-written phrases to help you express your experience. But that’s not all. You also need a well-formatted cover letter that won’t confuse the ATS. Luckily, My Perfect Cover Letter’s builder offers customizable cover letter templates that will help you wow both the robots and the humans reading your letter. You pick a recruiter approved Cover Letter sample, we’ll do the writing. It’s so easy! How do I make a universal cover letter for an entry level job with no experience? You can create a basic cover letter outline for an entry-level job with no experience, but do not make the mistake of thinking it is a "one size fits all" cover letter. It's essential to tailor your cover letter for each specific job application. Describe your skill set using the language of the job description. You can, however, choose a cover letter format, font, and a relevant skill or two that apply to your specific industry. Our cover letter tips can assist you in this task. What are cover letter samples? Cover letter samples provide guidance and inspiration as you write and format your own cover letter. My Perfect Cover Letter's sample cover letters are proven to work and offers options for your job role, industry, and level of experience. Each sample showcases a suitable length, font type and size, and layout. Our expert advice and real-world samples, can help you produce perfectly professional cover letters in minutes. First include your contact information, salutation, and introduction. Use this space to introduce yourself and begin a compelling argument as to why you're a good fit for the role. Then write your body paragraphs, conclusion, and sign-off. Here, you must share accomplishments, reiterate your claim, and use a professional sign-off (such as "Respectfully yours," or "Sincerely"). Our samples take care of most of the hard work for you regarding each component. Use them to create your own unique letter. Are cover letter samples addressed to whom it may concern? As our cover letter samples show, you should not use "To Whom It May Concern" in your salutation. It is far better to address the hiring manager by name. Writing a specific salutation instead of a generic one can boost interest in your candidacy. It shows that you put extra effort into your application. Learn who to address in your letter by first looking at the job description. If it does not mention the person, research the company's website. If you still have no luck, you can call the human resource department. As a last resort, you can write "Dear [Company Name]." What is a good format for a cover letter? Our samples exemplify the best formats for a professional cover letter. Only on rare occasions should your length exceed a single page. Stick to about four paragraphs. After your introductory paragraph, write one or two body paragraphs before crafting your brief conclusion and your sign-off. Bullet points are acceptable, but steer clear of more elaborate formatting tools. Complex color schemes, borders, graphics, and shading only distract readers from the most important part of your letter: its content. Send this document in the body of an email or as a Microsoft Word or PDF attachment. The cover letter samples from My Perfect Cover Letter are easy to follow and use. They point out the best approaches to craft a strong document. The My Perfect Cover Letter builder makes creating your cover simple. We have examples tailored to specific industries and positions so you can find one that applies to your situation. Comprehensive guidance: Our cover letter builder takes you one step at a time throughout the creation process. It shows you the best ways to write and format everything from start to finish. By the end, your document will look just like our cover letter samples. Advice for any experience level: Whether you are an entry-level job seeker or a seasoned professional, you will see powerful tips to turn your cover letter into a powerful document. Take your letter to the next level with our expert advice, builder, and samples. Start creating your perfect cover letter today!